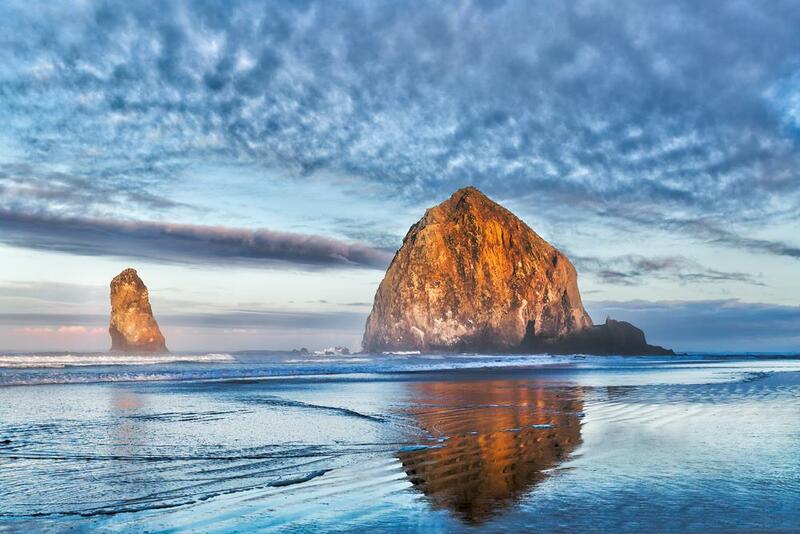 In June 2013, Cannon Beach made it to National Geographic Magazine's list, "The World's Most Beautiful Places." It deserves to be on the list because it truly is a stunning place! It’s a haven for campers, adventurers, foodies, and all sorts of travelers. 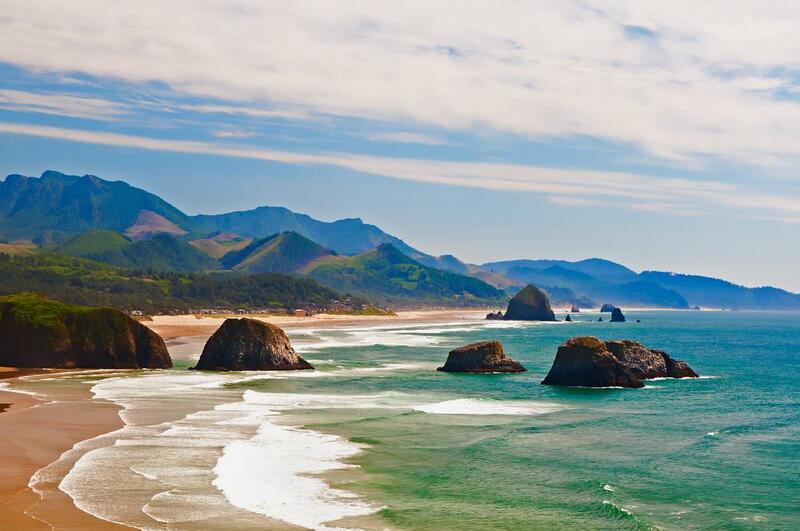 Northwest of Oregon, along the Pacific coastline, is where you will find Cannon Beach. It's a quaint City with breathtaking sceneries and beautiful beaches just a short walk away from downtown. Camping in and near Cannon Beach should be on your to-do list when you visit Oregon. Cannon Beach is home to many nature parks with one of the most scenic trails in the Northwest. Most parks are open for day hikes year-round. Fees vary in each place, but most of them only have a day-use parking fee at around $5. 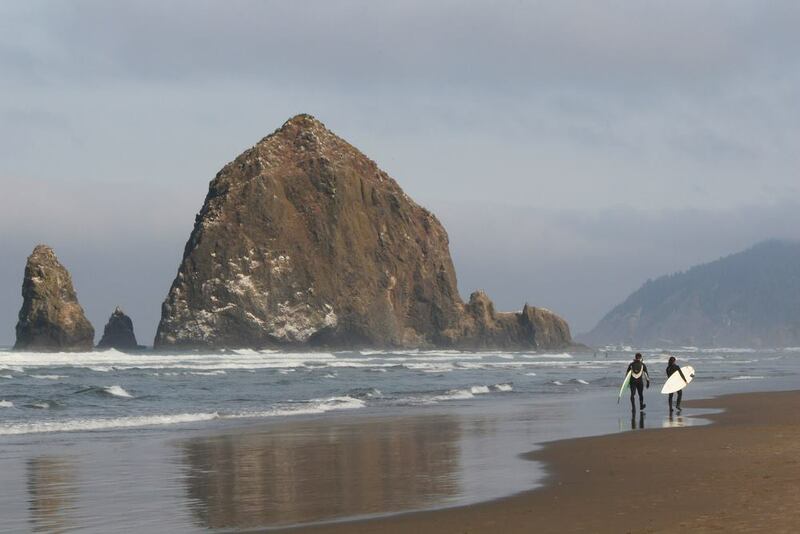 Around ten minutes away from Cannon Beach is a 2,484 acre park, Oswald West State Park. It holds a temperate rainforest, sandy beaches and miles of trails that feature breathtaking views of the Pacific Ocean. Day hikes are open year-round but there is no camping in Oswald West. However, there are lots of campsites nearby. This trail is about 2.3 miles and goes through a forest with spruce trees. It's an easy family-friendly hike, open year-round, with side trails to Blumenthal Creek and Falls. The end of the main trail is Cape Falcon which offers a series of viewpoints. You can see Neahkahnie Mountain and Manzanita town from some viewpoints. A less family-friendly and a more difficult trail is the hike to the Neahkahnie Mountain. The 8-mile hike starts off from the Short South Trailhead and ends at the Neahkahnie Mountain Viewpoint. A shorter version of the hike is 2.6 miles can kick off from the North Neahkahnie Mountain Trailhead. The north summit of Neahkahnie is not accessible because it's heavily timbered. But the south summit is accessible and you can see Neahkahnie Beach and the town of Manzanita. You can also see the coast all the way up down to Nehalem Bay Mouth. This trail crosses forests and meadows with wildflowers. Parts of the trail overlooks the ocean, The Devil’s Cauldron and Cape Falcon. For more information about the hike description visit, click here. 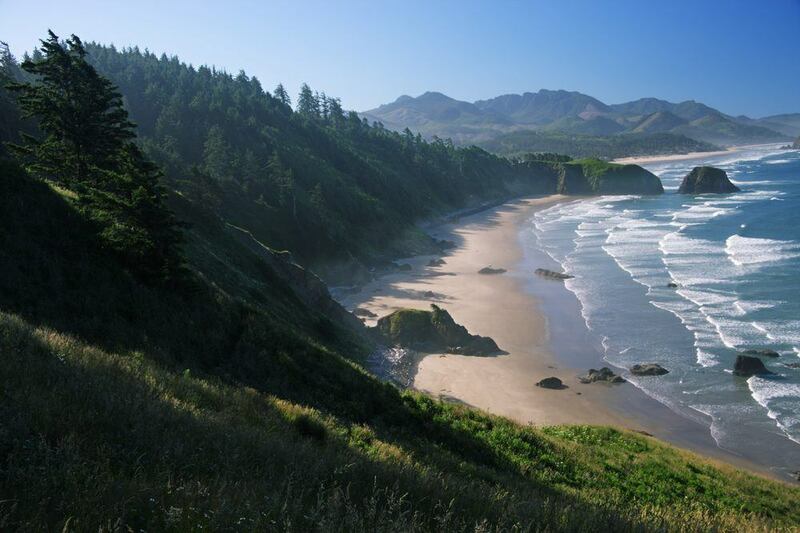 Stretching at 9 miles of coastline, Ecola State Park is another reason to visit Cannon Beach. The scenic hiking trails may be the main attraction, but visitors will be pleased by the other recreation activities it offers. Surfing, swimming in tidepools, and wildlife observations make the park a destination for all travelers. The Park’s main attraction is Ecola’s Point and Indian Beach. Both have viewpoints and picnic tables for you to enjoy the beautiful scenery, including the historic Tillamook Lighthouse. There are also vantage points for whale watching and bird watching. 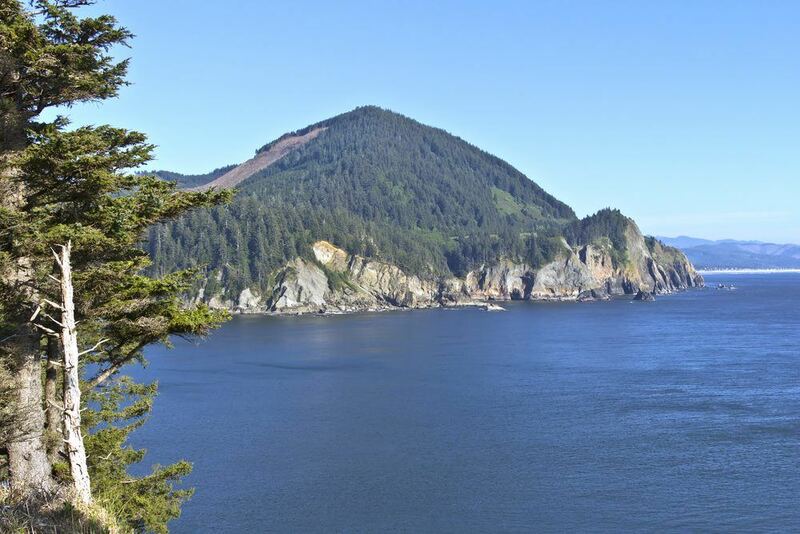 Hikers will also enjoy scenic trails to Indian Beach and Crescent Beach, Tillamook Head, and the Clatsop Loop. The Tillamook trail has a little history in it because it was the route taken by explorers from the Lewis and Clark expedition. From Ecola Point, you can walk to Indian Beach and Crescent Beach. Then from Indian Beach, you can find the Tillamook Head Trail. You can also find the Clatsop Loop Trail from Indian Beach. The total distance is about 3.6 miles from Ecola State Park Trailhead. The trail is family friendly and fairly easy. It is a secluded beach with quite a few daytrippers. From here you can enjoy Ecola Point, and Chapman Point. You can also enjoy tidepools during low tides. More experienced hikers and older children can probably take on the challenging trail to Saddle Mountain. The hike there and back is about 5.2 miles with a moderate difficulty level. It is a steep hike, but views of mountaintops and the Pacific Ocean await you. On the trail you will see colorful wildflowers, a lush forest, and salmonberry along the path. 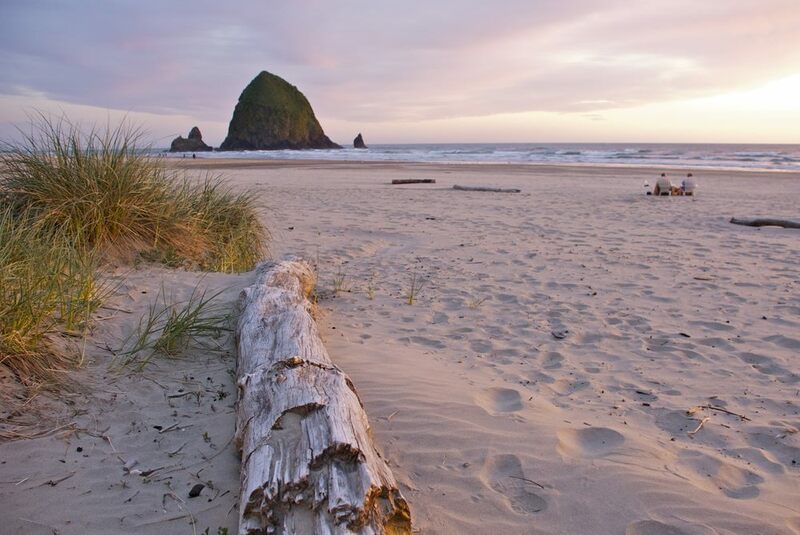 Visitors, especially romantics, can enjoy scenic strolls along miles of sandy beaches along Cannon Beach. It's also famous for the postcard attraction, Haystack Rock, a 325 feet tall rock on the beach. The water is quite cold and the tides are sneaky, so swimming isn't quite child and even adult-friendly. Instead, you can go beachcombing, strolling, wildlife watching and sandcastle making. You can also enjoy campfires at night. When the tide is low, tide pools form and you can see colorful marine life. If your feet are still itching for new places, you’re in luck. There are a lot of nearby beaches you can explore, each unique and beautiful in their own special way. Don’t forget to bring your folding chairs or beach mat if you just want to relax on the beach or to watch the sunset. To the south are Hug Point and Arcadia Beach. Further down is Oswald West State Park which has access to a trail to Short Sand Beach, a surf spot. 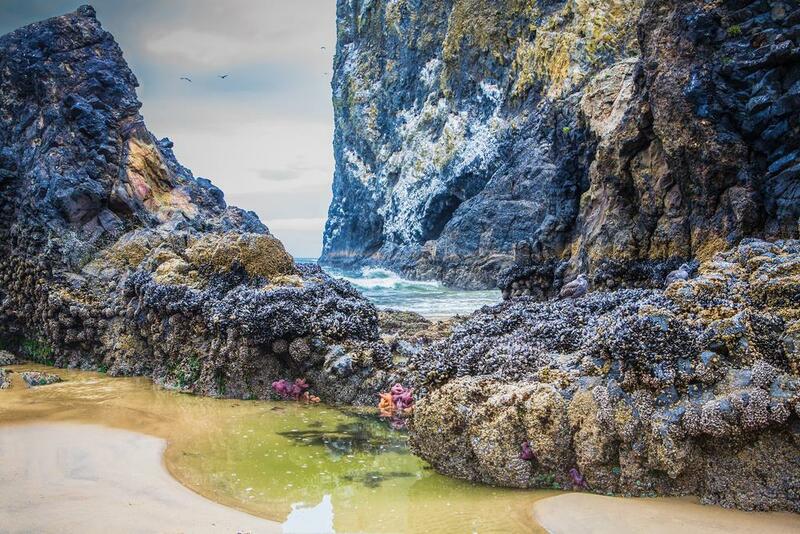 To the north is Ecola State Park which offers a trail to Crescent Beach and Indian Beach. However, the hike to Crescent Beach is for intermediate and advance level hikers. Nature and wildlife in Cannon Beach are quite astonishing. You get a mix of forest, mountains and beach in one! Cannon Beach is home to many animals and you will likely see them when you visit. How amazing would it be if you spotted several varieties of whales? Even for locals, it is still astonishing even if it happens often. Different kinds of whales often pass by throughout the year, but Gray Whales are the most common. They swim along the coast during their migration twice a year. They often surface and send a spout of mist in the air as they exhale. Bird watching is also common in Cannon Beach. The Haystack Rock is a nesting ground for Puffins so you will often see these birds on display. You might also spot Murres, Pelicans, and Eagles. Meadows in Ecola State Park and grassy areas of Les Shirley Park are places to see herds of Roosevelt Elks. You will see them during quiet seasons, early in the morning or late nights. You might see seals and sea lions bobbing in the water or on the beach. Sometimes, mother seals leave their baby seals on the beach while they go hunting. You might also see seals that are molting. If you see baby seals, just let them be. Do not move or touch them because it will lower their chances of surviving. In general, Oregon is a great place for camping, especially if you’re an outdoor lover. Camping gives you a better access to all the sites to see and hikes to trail. It also allows you to experience nature more intimately. Camping in Cannon Beach brings you close to stunning beaches and rich nature and wildlife. You’ll Here are some businesses that offer RV Camping and Tent Camping. Did you know that Cannon Beach was in the list of America’s 100 Best Art Towns? You’ll soon discover that it’s not only a place for beach goers and nature lovers. Cannon Beach offers live glass blowing, theater performances, and many art galleries. Plus, it's a fun town to go strolling. The architecture and public art will satisfy the artist in you. Food culture is also diverse in Cannon Beach, so foodies will not be disappointed. From fine dining to seafood galleys, cozy cafes to lively pubs, and local cuisines to international - there’s many to choose from. We’re sure you will find something to suit your taste. Are you a more adventurous type? Or do you prefer a tropical beach camping? You might want to consider Anawangin in The Philippines. Did you enjoy this list of reasons to go camping near Cannon Beach? It really is a beautiful little place with so much to offer. We hope visitors will enjoy it more than they expect. What do you think you’d like to do when you’re in Cannon Beach? If you’ve visited the place, what do you recommend? We’d love to read your answers in the comment section!